'Support for mortgage interest' for 110,000 people is being cut and less than 10% have applied for the loan offered by Serco to replace it. A cut to welfare payments by the Department for Work and Pensions (DWP) may be about to cause a hundred thousand vulnerable people to default on their mortgages within months figures show, unless urgent action is taken. The government is axing “support for mortgage interest” (SMI), a welfare payment in existence since 1948, that helps vulnerable homeowners pay their mortgages – and only a fraction of 110,000 households who currently receive it have applied for the replacement scheme. SMI pays the interest on private mortgages for those who can’t themselves – helping people who are unemployed, disabled, single parents, pensioners or in other vulnerable groups keep their homes through perilous financial circumstances. But the DWP are scrapping the welfare payment and handing it’s replacement over to Serco, giving people no other option but to apply for a loan with the company. The outsourcing giant will offer loans to those formerly on SMI to pay their mortgage interest – the loans themselves also accruing interest – which in itself is an incredibly regressive move by the Tories. And it gets worse – on the 5th of April the payments made by the DWP to mortgage lenders on behalf of the benefit claimants will end but figures show that so far only 6,850 of 110,000 have signed up for the Serco loan. Asked by Radio 4’s Money Box on Saturday how many people had applied for the replacement scheme offered by Serco, the DWP refused to update the two week old 6,500 figure, suggesting few if any further applications have been made. The DWP themselves then warned that if people don’t take the Serco loan, they may face default and their home be repossessed. That means if nothing changes over a hundred thousand people could default on their mortgages – and potentially face repossession of their homes – in a little under two months. It’s incredibly irresponsible for the Tories to offer those on SMI no option but take out a private loan in order to stay in their homes. As the 5th April deadline approaches, the government should reconsider the rollout of the scheme or risking making nearly a hundred thousand people homeless. Another example of those at the bottom of the pile paying for this governments incompetence. Note that the mortgage providers won’t suffer. They can always repossess and sell when there is still a margin to cover profit margins. Besides which after 70 years the Tories can destroy Mr Attlee’s wish to introduce legislation to help those in need while they promote the fortunes of another infamous outsourcer. This chipping away at every nook and cranny of the welfare state is the feature of a government that cares not for the consequences of its actions. This cut (or conversion of regular payments to a loan) probably saves the Treasury a couple of hundred million – a tiny sum out of total expenditure of £800bn but which could generate reactive costs of evictions, bed and breakfast special payments. I cant see how you can convert a regular payment into a one-off loan unless it is so large claimants can reduce their mortgage payments so they don’t need SMI but there is also interest on the supplementary loan. Any ideas? And of course, paying back the Serco loan! A little bit of a shame that the picture accompanying this piece is not of the sort of properties that vulnerable people might be made homeless from. 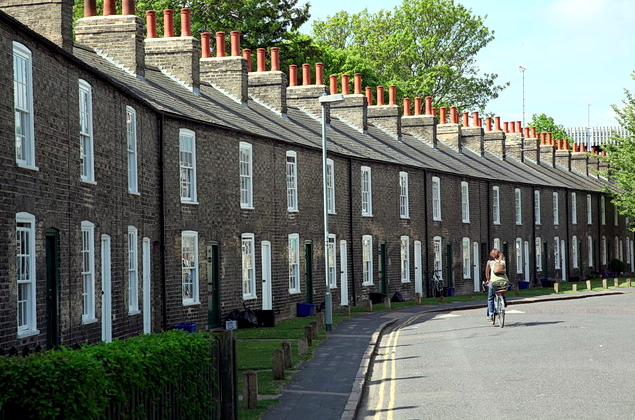 It is a beautiful line of small cottages near Parker’s piece in Cambridge that are largely owned by one of the colleges. They are kept in very good condition and are much appreciated by students who live in them. That doesn’t, however, detract from the importance of this piece! This is deliberate Tory cruelty. It isn’t incompetence, they know exactly what they are doing. Once nasty, always nasty – its as simple as that.